The ideal solution for wiring your Lazer RS range Lamp. The setup is quick, easy, and reliable with TE Superseal connections and no configuration procedures. 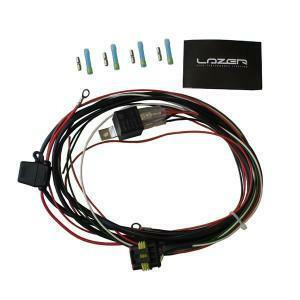 Lazer harness kits feature a 12V relay, 15A fuse, and battery terminal at one end. We use the best corrosion proof splice systems currently on the market, comprising copper crimp barrels and separate, heat-shrinkable transparent sealing sleeve, ensuring that the connections for: daytime running lights, position light, and driving light remain fully protected.